Transforming your content by making it accessible in the cloud is the first step to digital transformation. Where are you on this journey? No matter where you are, there is always room to grow. It's not just about where you want to end up but how you'll get there and which tools you'll use. Read the latest AIIM report that lays out a comprehensive strategy to help get you there. 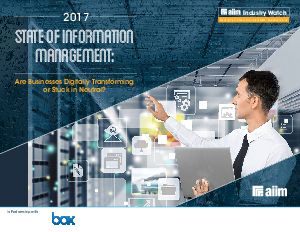 Download the full report, AIIM 2017 State of Information: Are Businesses Digitally Transforming or Stuck in Neutral?